When Nancy Pierce’s parents suggested she take an aptitude test in college, she found out that she had strengths in horticulture. Although she had planted vegetables with her mother growing up, she eschewed that calling and apologized to her parents for wasting their money on the test. Rather, she pursued nursing and teaching as a career. Little did she know that horticulture would, in fact, become a big part of her life. In 1997, Nancy and Robert moved back to Dallas to a house in Preston Hollow on Tulip Lane, and she was inspired to continue growing roses. With a two-year-old son and another on the way, she longed for a rose bed. “Being quite pregnant at the time, my mother offered to have someone come build my first Dallas rose bed.” Having room for 33 roses in that bed and a lot more space in her yard, Nancy realized she could build more beds and plant more bushes. Robert thought they ought to plant additional rose bushes in the front yard since their house sits on a well-traveled corner, and more people could enjoy the roses. Nancy began researching roses all throughout North America. “I did a lot of research. 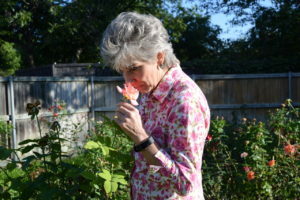 I reviewed catalogues, scanned the Internet and discovered the website helpmefind.com/roses — it’s my rose bible.” She also goes to many botanical gardens, including the Dallas Arboretum, and she sometimes visits growers. Roses became a family affair for the Pierce family. With two sons, Chip and Jack, Nancy had three capable men to help her take care of her passion. It takes Nancy 16 hours just to prune the bushes in the spring, so she spends many hours tending to them. Two years ago her rose garden was submitted to the archives of the Smithsonian Institute, showcasing her amazing rose growing acumen. Nancy Pierce stops to smell the roses. All along, she documented her roses in a detailed spreadsheet and took thousands of photos of them over the years. Someone suggested she use her beautiful photos to create a notecard collection, which she’s done. “My legacy is now my rose card business.” Additionally, she is working on her website, fittingly named Texas Rose Lady, with stories and rose growing tips. This past summer, the Pierces sold their home on Tulip Lane and were unable to move their multitude of roses with them. Nancy kept a dozen unique and hard to find rose bushes for her new home where she has limited sun and space to garden. 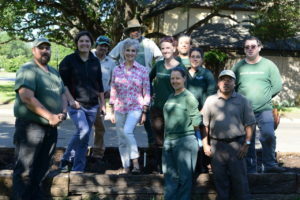 After meeting with Dallas Arboretum President Mary Brinegar this summer to talk “roses,” Nancy got the idea that maybe the botanical garden would be a good place to donate the 200 rose bushes. The roses will be planted in the Boswell Family Garden with a sign that reads, “Donated by Robert and Nancy Pierce in honor of Cherrie Perkins Wells,” Nancy’s mother. That’s how the roses that used to be on Tulip Lane ended up at the Arboretum.